Ever wondered what it would be like to wake up in the morning with no idea where you are, who the man in the bed is beside you, and when you look in the mirror, you're about twenty years older than you last remembered? Then you take the day to be brought up to speed, to find out that you had a horrible accident that causes your brain to reset every night while you sleep, erasing everything from the day before. Kind of like 50 First Dates, but this definitely has a more sinister twist. 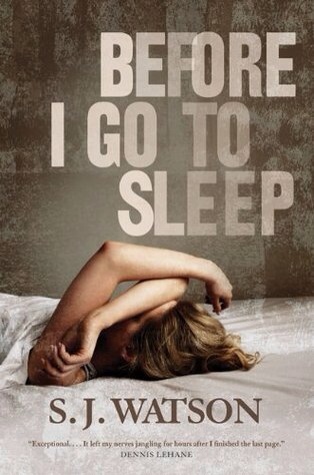 This is the story of Before I Go to Sleep by S.J. Watson. This is the story of Christine. She wakes up every morning to be introduced to her husband Ben, who proceeds to tell her that she has been married to him over 20 years. She has no memory of meeting him, of their life together, and the last 20+ years. Then off he goes to work, and she is left to try to deal with this and figure it out on her own. So off we go, through this diary, to try to figure out what has happened to Christine since her accident, what the accident actually was, why she has been disconnected from all the people that she cares about, including her best friend Claire, and what the heck is actually going on here. This was a really good book. I really liked it. I don't read very many thrillers, but this had an aspect to it that hooked me, and kept me throughout. It was a quick read, I think it took me about a day to finish. There was a constant feeling throughout – a feeling that there was something wrong, something not quite right. I really have to say though, it kept me guessing right until the end. My only slight difficulty with this book was the ending. Without any spoilers, I found that the author tied it up a little too well at the end. Feeling like I was hanging over the edge of a cliff throughout the whole book, I maybe would have liked to have been left hanging a bit at the end of the book. Overall, I recommend this book to just about anyone, it was a compelling, entertaining read, and worth the day you'll spend reading it as the vacuum sits untouched and the dirty dishes remain unwashed. 4 out of 5 stars on this one.